Celebrate Seafood with The Dillingham Salmon Melt! October is National Seafood Month so without a doubt you are seeing a lot of press swirling around this highly nutritious protein. To celebrate, I could certainly feature an array of ideas, species and dishes but in an attempt to keep things simple I’m going to share my recipe for an affordable, quick and comforting dish–the Dillingham Salmon Melt. I created this simple lunch dish for myself last spring while I was researching, developing, and testing recipes for canned Alaska sockeye for the Bristol Bay Regional Seafood Development Association. This recipe was created early on in my adventure, and I made it one cold and rainy Seattle day. It was ridiculously easy and incredibly comforting for lunch so I am happy to share it with you here. I’ve dubbed the recipe the Dillingham Salmon Melt because Dillingham, Alaska is home to the Peter Pan Cannery, one of the longest continually operating salmon canneries in Alaska. I’ve toured that historic blue clapboard cannery twice and it’s a true maritime icon…not to mention a salmon processing workhorse! 1. Get a can of Alaska sockeye salmon, which can easily be found in the canned fish section of the supermarket. You can get a small or large can, and I should note that the salmon will most likely contain the skin and the bones, which do NOT need to be picked out because they were cooked and softened during the canning process. Open and drain the can, discarding the liquid. 3. Cut your English muffins in half and toast lightly in the toaster, transferring to a baking sheet. 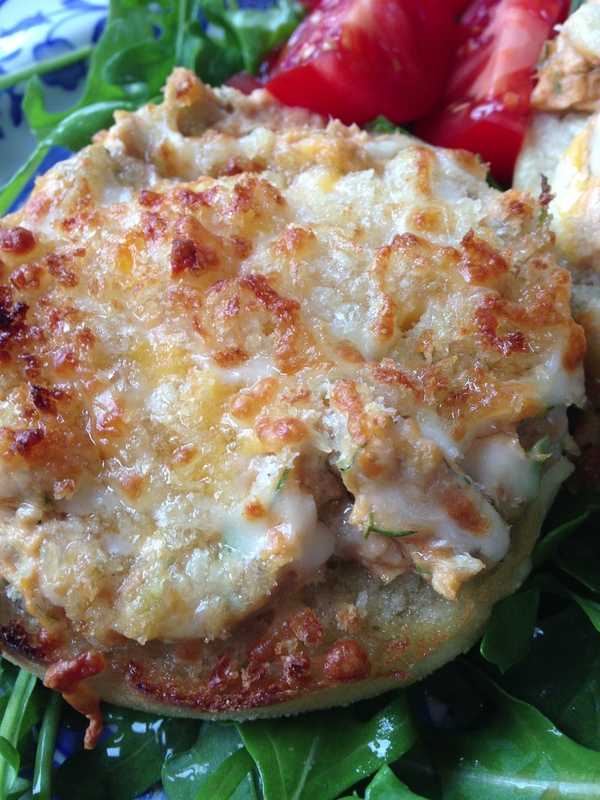 With a tablespoon, scoop up the salmon mixture and place it on the English muffins. 4. Take 1/2 cup or so of panko (Japanese breadcrumbs) and toss in some grated cheddar or Parmesan. Sprinkle this evenly over your salmon sandwiches and drizzle the sandwiches with a little melted butter if desired. Put the salmon melts under the broiler and watch carefully, cooking until they are browned and heated through. 5. Serve on a bed of lightly dressed greens and enjoy! If you’d like more information on canned Alaska sockeye salmon as well as my recipe for Three Minute Salmon Salad, head over to Bristol Bay Sockeye.org. Let’s talk about salsa. 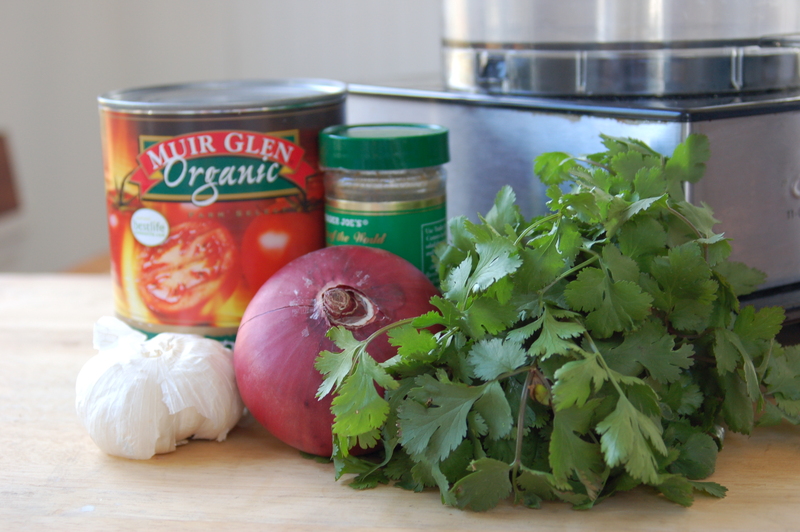 Of course, there are endless options on the market these days…jarred, canned, fresh and refrigerated. Deliciously versatile and a staple in most households, salsa can quickly and easily be made at home. I started making my own many years ago. Admittedly, I don’t always make it from scratch but when I do, it’s far superior to any that I can purchase on the market. 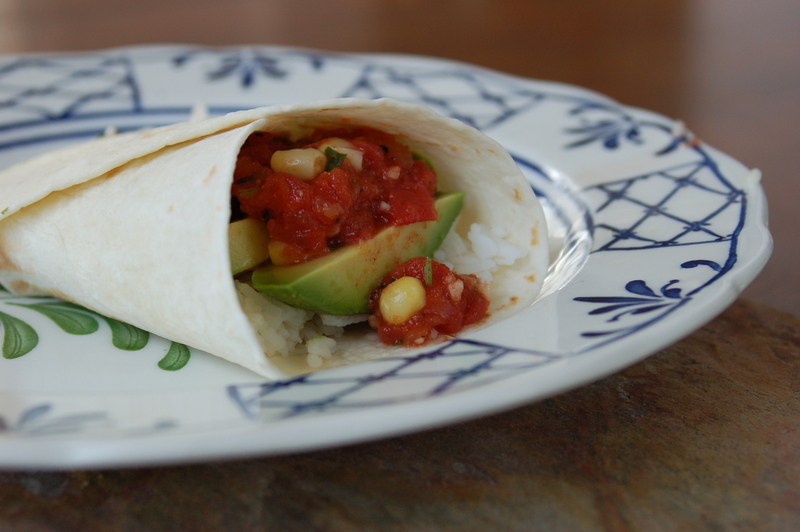 I developed this super simple salsa when my children were very little. Back then their peewee taste buds were purer and more sensitive. They didn’t always like the harsh and fiery salsas being sold. Rather than skip the salsa all together, I developed this basic version, which allowed me to leave the hot peppers out of the picture while at the same time allowing me to sneak tomatoes and corn (precious nutritional commodities aka vegetables!) into my children’s diets. I also love this recipe because it can be quickly and easily made in my Cuisinart mini chopper or food processor. Using only a few basic ingredients and lots of fresh coriander, this refreshing and bright salsa is great with tortilla chips, in burritos and cheesy quesadillas or dolloped on top of a fish taco or grilled salmon. With the metal blade in place and the motor running, drop the garlic clove into the food processor, letting it bounce around and get diced. Add the red onion and coriander sprigs through the feed tube and pulse the mixture seven or eight times. Drain about half the liquid from the tomatoes and add the tomatoes to the work bowl with the olive oil, the cumin and a little salt and pepper to taste. Season the salsa taste with additional seasonings if necessary. Add the corn and pulse once or twice to mix.